When traveling to the Philippines, do not forget to visit the Boracay island. This beautiful island will be a very nice vacation spot. Boracay is one of the famous tourist attractions in the Philippines. This island is a tourist destination known for its beaches with white sand and clean. Boracay was awarded in 1990 as one of the best beaches in the world by the BMW Tropical Beach Handbook and again received an award as the number one tropical beach in the world by a British TV show, TV Quick. Boracay also known as coastal and marine activities, such as diving, snorkeling, sea walking, jet skiing, parasailing, or just island hopping to some of the smaller islands surrounding Boracay. There is also a bat cave attraction and Puka Beach, where there are many types of Puka shells. Boracay Island is 315 km from the southern city of Manila, the Philippine capital. From Manila the plane will go to Panay Island, the closest island to Barocay, and continued with the ship to arrive in Barocay. Beside it, in Manila or Panay Island there are many travel agents will offer you the trip to Barocay Island. 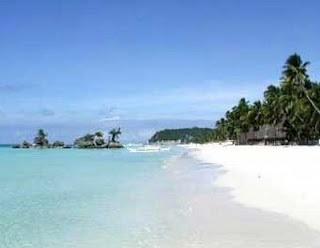 Boracay has two main beaches, namely Bulabog Beach and White Beach. In White Beach, you can feel the white sand beaches as smooth as talcum powder in the area. This place was a favorite place for the traveler. However, the beach is kept clean, maintained, and certainly tempting. Not only that, you can dive and snorkel around its shores. At night, many tourists who partied with witnessing various exciting performances at this beach. White Beach is the center of Boracay and a gathering place for tourists. Here there are a lot of inns, restaurants, cafes, tourist information center, gift shop, to the post office. There are lots of some cheap lodging in White Beach, you can spend the night there. Bulabog Beach, is more empty. Quiet and peaceful. Added with fine white sand, calm sea water, and there is also seaweed carried by water currents. very enjoyable, away from the crowds. One of the things that will make you more comfortable relaxing in Bulabog beach is a sea breeze. You can lay down on a stretch of white sand, shade under the coconut trees and the sea breeze accompanied, really maximum comfort. Here you can also see the tourists play kiteboarding. Different sports surfing using a parachute as a steering and power source, and then they jump and conquer the waves with an extraordinary way. With white sand beaches and crystal cold waters of Boracay island provides the main attraction, pleasure and adventure in the charming paradise are as endless offerings. There is a wonderful selection of attractions on Boracay to keep you busy exploring for days and nights. Boracay is the place that you have to experience by yourself.